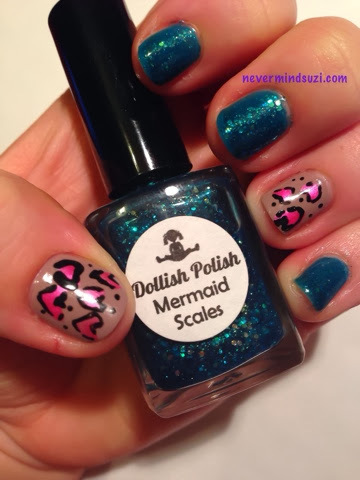 Isn't it nice when you get your hands on a discontinued polish. Dollish Polish - Mermaid Scales is a purchase I recently made from a friend. I was also in a nail art mood and it was coming up to Valentine's Day when I did this. 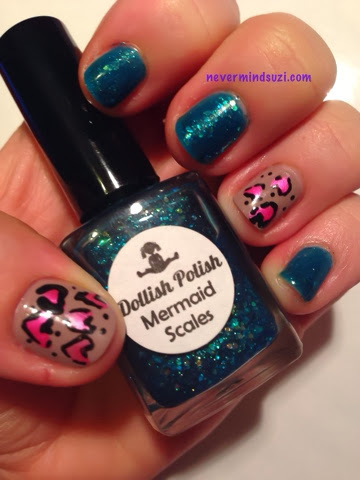 Mermaid Scales is a teal/ocean green jelly, I used a number of thin coats to build this polish up. There are teal/ocean green and golden glitters. Beautiful! My ring and thumb accent have a base of Nails Inc - London with Jess - Playmate leopard print style love hearts. I used the Barry M black nail art pen, I personally prefer the Models Own but couldn't lay my hands on it.